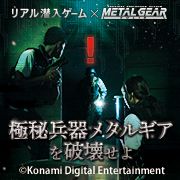 Real Stealth Game x METAL GEAR SOLID “Destroy a Top Secret-weapon Metal Gear” will be closing on March 31st, 2019. Hide in card boards, hold up the enemies, pass all the traps to complete your mission! If you haven’t experienced the only real life event you can feel the world and thrill of “METAL GEAR SOLID” series, come to Shinjuku and enjoy!